[1 November 2011] -- The heritage city of Agra is one of the world’s great tourist destinations. Each year, millions of visitors travel to this city in Uttar Pradesh to visit the world-famous Taj Mahal, the Agra Fort and other Mughal monuments. With such attractions, the city has enormous potential for developing a strong and broad-based economy centred on tourism. While the city has expanded rapidly as a result of its tourism potential, much of that growth has been unplanned and chaotic, creating development challenges that could impede the city’s valuable tourism industry. In particular, poor sanitary conditions exist throughout the city, especially in its growing slum neighbourhoods. The challenge has been to capture the benefits of Agra’s potential for all its residents. To that end, the Cities Alliance has supported the city of Agra to develop a city development strategy (CDS) that integrates local development. Unlike many other strategic planning initiatives underway in India, Agra’s CDS also includes the compilation of solid citywide data on its informal settlements to enable better planning. 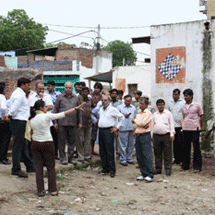 Building on the CDS, the Cities Alliance is currently supporting the Agra Municipal Corporation (also known as Agra Nagar Nigam, or ANN) to develop and implement a citywide upgrading programme that links economic development planning with upgrading. 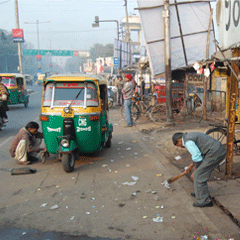 Cities Alliance support to Agra Municipal Corporation began in 2006 with a grant to develop a CDS as part of the Jawarharlal Nehru National Urban Renewal Mission (JNNURM), India’s massive urban reform and development initiative launched the same year. The development of the Mughal Heritage Walk, a one-kilometer walking loop that links the Taj Mahal with some of Agra’s lesser known Mughal monuments. As a result of the CDS process, ANN has developed the much-needed capacity to respond to the needs of informal settlements in the city and is better prepared to implement reforms that benefit its poorest residents. Through the CBIS information system, the city now has access to accurate, citywide data on its informal settlements that it can use to develop demand-based slum upgrading plans and monitor slum upgrading activities. The process has also helped ANN engage positively with the city’s slum dwellers and actively seek to include them in city planning. City engineers have participated in community discussions on service issues, undertaken joint site visits with CURE to understand local concerns, and participated in planning exercises. In addition, district and other urban local bodies have begun interacting with local community groups and involving them in programme advocacy and awareness building on key issues such as hygiene. The CDS process – in addition to the Cross-Cutting Agra Project, which effectively established a demonstrable model for inclusive planning for slum upgrading and sustainable livelihoods – laid the groundwork for a second major activity: the development of a citywide slum upgrading plan for Agra. Strengthen the capacity of local institutions to implement participatory slum upgrading projects. Begun in 2010, the activity has already made significant progress in a number of areas. The city has been grouped into 37 wards on the basis of geographic proximity and common features, and an upgrading plan developed for each ward that includes housing designs. To date, plans have been developed or are under development for 16 of the 37 wards, and two of the city’s most vulnerable wards have been identified for implementation of their plans. The initiative has also helped strengthen partnerships at the city, state and national level that are key to citywide implementation. Slum communities are mobilising and are beginning to organise into issue-based groups, which enables them to better interact with city officials at community meetings and initiate small-scale projects in their neighbourhoods. The Agra CDS process supported by Cities Alliance linked in with USAID’s Cross-Cutting Agra Project to undertake an innovative pilot initiative aimed at developing a livelihood support programme and improving sanitation conditions in the Kachhpura neighbourhood of Agra. As part of the initiative, a community tourism project was developed in Kachhpura. It involved building the community’s capacity to organise, network with the tourism industry and attract tourists to the Mughal Heritage Walk – a tour through the Mughal monuments in and around Kachhpura that has ensured a steady income flow for the youth in the community. The Uttar Pradesh Tourism Department is working closely with CURE to replicate the Kachhpura project elsewhere. The initiative also included subsidising and promoting community-led savings schemes for the construction of individual sanitation units and street paving. CURE has been able to further improve the sanitation conditions in Kachhpura by mobilising small grants to build a decentralised waste water treatment system in the neighbourhood as well as an overflow drain funded by Water Trust UK.